The NATorigin range of ‘extreme tolerance’ and hypoallergenic skincare products and make-up uses at least 97% naturally sourced ingredients, which are especially suited to contact lens wearers and those with sensitive eyes. 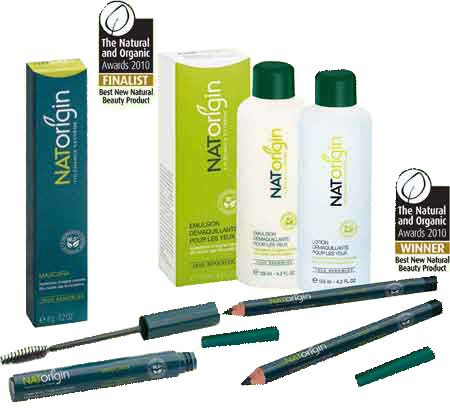 Throughout July, two SkinsMatter.com guinea pigs have been testing three of the biggest selling items in the NATorigin range: the NATorigin Mascara; the NATorigin Pencil Eye Liner (which was the winner of the Natural and Organic Awards 2010 Best New Natural Beauty Product); and the NATorigin Eye Make-Up Remover Emulsion (a finalist in the same category). The testers were Hazel, a contact lens wearer with sensitive skin and easily irritated eyes, and Stephanie, a tester with no sensitive skin or eye issues. Here’s what they had to say about the products. The Mascara is available in brown, black, blue and green. It is vegan and made from 98.5% naturally sourced ingredients. Click here to buy and for further information. The Eye Liner is available in blue, black, brown and green, and is made from 100% naturally sourced ingredients. The Emulsion is made from 98% naturally sourced ingredients. Other products in the NATorigin range include Detoxifying Moisturising Cream, Firming Anti-wrinkle Cream, Regenerating Lifting Serum, Facial Cleansing Milk and Facial Cleansing Water. The range boasts excellent ‘free from’ properties, which we know are of major concern to SkinsMatter.com readers: all products are free from parabens, phthalates, mineral oils, silicones, chrome and ingredients of animal origin (hence are vegan friendly).